Statues are a problem. Specifically statues of people. A statue (or sculpture) of a person generally indicates that this person had such an impact, or was so notable, that their contribution should be recognized for decades or centuries into the future. The problem is that society constantly upgrades itself in terms of what’s acceptable and/or reprehensible. So someone who lived 150 years ago might have been considered normal and heroic, whereas now the casual details of their lives make them villains. But there’s still a statue for them today, and they’re still presented as heroes to new generations. Then there’s the other, equally challenging, problem that people who do fantastic things on the scale of hundreds of years tend to also do horrible things. Especially men. I think testosterone might be a major factor. It makes us want to stand out by being special, and that “special” often manifests in atrocious ways. What society considers acceptable behavior keeps getting upgraded, while the lives of great people in the past does not. Many people (especially men) who did enough to get a statue made of them, also did horrible things as well. So the question is, when do you take down a statue? When do you stop teaching young people that this was a great person? Ghandi was a horrible racist against black people. Martin Luther King Jr. was an adulterer who plagiarized his dissertation. Thomas Jefferson hated slavery but loved luxury, so he kept slaves himself. Bill Clinton cheated and lied to everyone about it. General Lee fought against the U.S. for his state. For some people the switch is obvious. Adolf. Saddam. Columbus. They did so much harm that any good they did gets erased. No questions asked. But for the list above it’s much harder. General Lee didn’t even have a preference on who to fight for. He put it to his state to pick, and went with their decision. If they’d have said to stay with the Union he would have fought on that side. Ghandi helped free a country from British rule, and inspired millions, including JFK, to oppose things non-violently. Bill Clinton was by many measures a great president, giving us a strong sense of unity and a strong economy. Jefferson founded many of the best principles of our country. MLK helped start the civil rights movement, and has moved black people forward int his country in a way that has not been matched by anyone. Hamilton was one of the most honorable and brilliant founders of our country. So the question is simple: which statues do we take down? And actually it’s not about the statues. It’s about what they represent, which is timeless respect. Which horrible things, of what magnitude, are able to be overlooked in a great person? And what level of greatness must they achieve in order to cancel out such negatives? 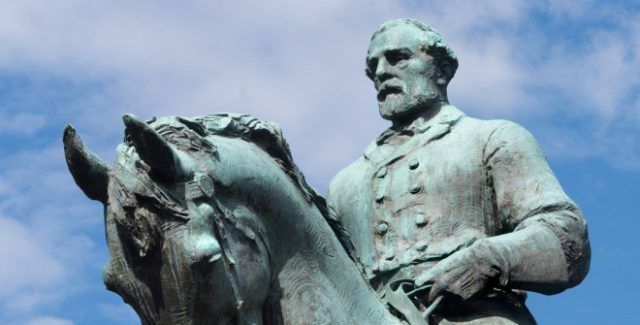 The statue of General Lee that’s loosely tied to the violence in Virginia right now is a case in point. He was a good general. He represented his people. He deserves some measure of respect for that. But he was also fighting the U.S., in open rebellion. And he was defending an economy based on slavery. I don’t have answers to these cognitive-dissonance raising quandaries. They’re complex and nuanced and subjective. But I can tell you for certain that more people should be thinking about the question.